Chase transferred to Monticello from St. Annes-Belfield prior to this school year, quarterbacking the Mustangs defense from the safety position after starting at quarterback for STAB prior to the transfer. During his senior season, Chase totaled 60 tackles including five (5) tackles for a loss, three (3) interceptions, and eight (8) pass breakups. As the starting quarterback for STAB, Chase totaled 1,700 yards as a junior, including 28 total touchdowns to go with 40 tackles and two (2) interceptions on defense. Bailey is a founding member of Monticello’s Mountain Bike program, the first public high school mountain bike program in the state of Virginia starting in the fall of 2015. During her junior year, Bailey ranked first in the state Virginia Interscholastic Cycling League rankings in the JV Girls division. Having competed in 36 races over the course of her four years with the spring of her senior season still to come, Bailey was the top female cyclist in three of the four VICL races last fall, finishing second in the one race she didn’t win! Bailey shared that Mountain Biking at Monticello High School changed her life and changed it for the better as she joins the Emergency Medical Services and Management School at Lees-McRae. 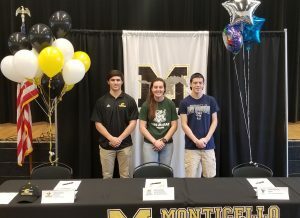 Andrew will become the second student in Monticello High School’s 20-year history to continue his career in tennis at the collegiate level. With his senior season as a Mustang still to come, Andrew finished his junior season 13-6 overall as the #1 seed, competing against the opponent’s best player every match. After his junior high school season, Andrew went on to place in the top four (4) in the Virginia state clay court and state hard court championships, with an individual ranking in the Top 50 in the USTA Mid-Atlantic Region for the Class of 2019. 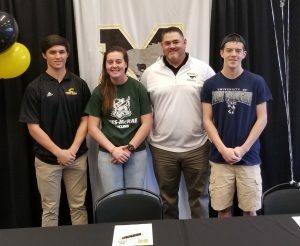 Including today’s ceremonial signings, five (5) members of Monticello High School’s Class of 2019 have committed to continue their careers as student-athletes at the college level. For a complete listing of former Monticello student-athletes who continued their careers at the collegiate level, please visit https://monticellomustangs.org/mustangs-in-college/. For more information on Monticello athletics, please contact Director of Athletics Matthew Pearman at (434)244-3130 or at mpearman@k12albemarle.org.